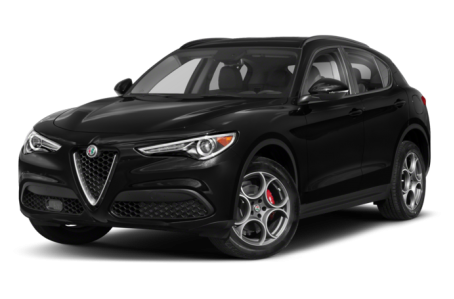 The 2019 Alfa Stelvio is a mid-size luxury SUV that seats five passengers. Maximum cargo capacity is 56.5 cubic feet with the rear seat folded down. Under the hood, the Stelvio is powered by a standard 280-hp, turbocharged 2.0-liter four-cylinder engine mated to an eight-speed automatic transmission. Rear-wheel drive comes standard, while all-wheel drive (AWD) is available. The Quadrifoglio has a more powerful 505-hp, twin-turbocharged 2.9-liter V-6 mated to an eight-speed automatic and AWD.